The SPC-101 Cover is designed to protect the static ports from damage during routine ground maintenance or storage of the aircraft. Universal design to fit most aircraft. Lightweight - entire assembly weighs less than one half a pound. 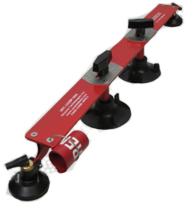 Attaches with heavy duty lever cups designed to hold 40 pound removal force. Prevents the possibility of damage to static ports by being an externally mounted cover. Malleable light guage anodized aluminum easily conforms to virtually any surface. Adjustable to allow for attaching lever cups on or around decals and pin striping. Installed at temperatures from -20ª F to 220ª F.
Identification numbers or logos may be printed on parts or warning streamers. The SPC-101SPF Cover is designed to protect the static ports from damage during routine ground maintenance or storage of the aircraft. The SPC-102 Cover is designed to protect the static ports from damage during routine ground maintenance or storage of the aircraft. The SPC-102SP-H60 Cover is designed to protect the static ports from damage during routine ground maintenance or storage of the aircraft. Overall size: 17" length x 3.5" width x 3" height. Suction Cups are 2" in diameter. Cover cups are 3.5" in diameter. 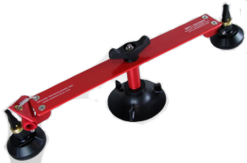 Suction cups hold 40 pounds each. Minimum cover cup center to cover cup center is 3.75". Maximum cover cup center to cover cup center is 6.5". Body total: 12" x 1.5". If the aircraft has a single port, or double ports that are more than 4.5" total width apart, the SPC-101 Static Port Cover is required. If the double ports are less than 4.5" apart, the SPC-102 would be required. If the ports are more than 4.5" apart, the SPC-101 would be required for each port.